A loon flaps its wings on an Oxford County pond on Aug. 15, 2015, just before dark. A New England loon has died from avian malaria, according to researchers who believe this to be the first known case of a loon dying of the tropical disease. The loon was found floating last summer on Lake Umbagog, a 7-mile-long lake straddling the New Hampshire and Maine border, and was quickly brought to scientists for examination. In less than a week, the avian malaria was detected, surprising wildlife biologists and stirring conversations about climate change and its future impact on wildlife. Avian malaria is carried by certain species of tropical mosquitoes. There is no evidence that avian malaria parasites are harmful to humans, according to Mark Pokras, professor emeritus of wildlife medicine at Tufts University. The dead loon was spotted by campers at Umbagog National Wildlife Refuge on July 6 and quickly retrieved by a refuge employee. The bird, specifically a “common loon,” was then put on ice and brought to the New Hampshire Veterinary Diagnostic Laboratory in Durham for examination. “We look at everything. We look for evidence of trauma, infectious disease, examine all of the various body parts,” Inga Sidor, a New Hampshire state senior veterinary pathologist who examined the loon, said. Going into the examination, Sidor wasn’t even considering malaria to be the cause of death. She previously had detected malaria parasites in captive birds, such as penguins kept in zoos, but she had never seen malaria in a wild bird. In the early 2000s, Sidor worked with a team of scientists capturing loons in New Hampshire, Maine and Canada to test their blood for malaria parasites. At that time, no parasites were found. So you can imagine Sidor’s surprise when she discovered the Umbagog loon to be filled with malaria parasites. That’s when she started to look for avian malaria, a disease that attacks red blood cells, affecting the vascular system. Having such a fresh specimen was crucial to the discovery. Sidor found widespread malaria parasites in the bird’s brain and heart, which leads her to believe the bird died either from a heart attack or cerebral paralysis. Furthermore, the degree of the infection leads Sidor to believe the disease was transmitted to the loon in New Hampshire, not when it migrated south to winter off the coast of mid-Atlantic states. The Loon Preservation Committee based in Moultonborough, New Hampshire, monitors loons throughout New Hampshire and has been heavily involved in this case. After Sidor’s examination, the loon was inspected by Ellen Martinsen of the Smithsonian Conservation Biology Institute, who discovered that the bird contained not one but two different malaria parasite species — an unusual find. Martinsen, who was unavailable for interview for this story, is collaborating with the Biodiversity Research Institute in Portland to analyze blood samples taken from live loons throughout North America. “It’s definitely something that’s been high on our priority list that we want to be looking at and tracking in these loons, year after year,” Michelle Kneeland, a wildlife veterinarian at the Biodiversity Research Institute, said. As researchers attempt to answer these questions, they’ll need help from the public, Pokras pointed out. After all, if the campers at Umbagog hadn’t reported seeing the dead loon, researchers may not have made this startling discovery. 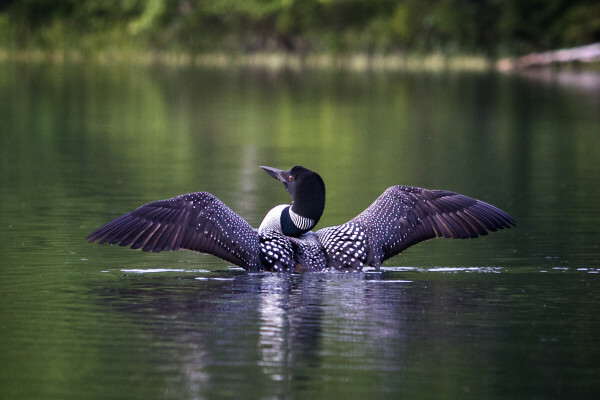 The Maine Audubon enlists people of the community to conduct annual loon counts, which this year takes place on Saturday, July 16. For information, visit maineaudubon.org/wildlife-habitat/the-maine-loon-project/.